It’s Day 345 and I finally got to do a shadow box. I love today’s artist. The crazy storm that hit the Bay Area has caused power outages and flooding everywhere, but I still did my piece! I am posting now just in case the power goes out. 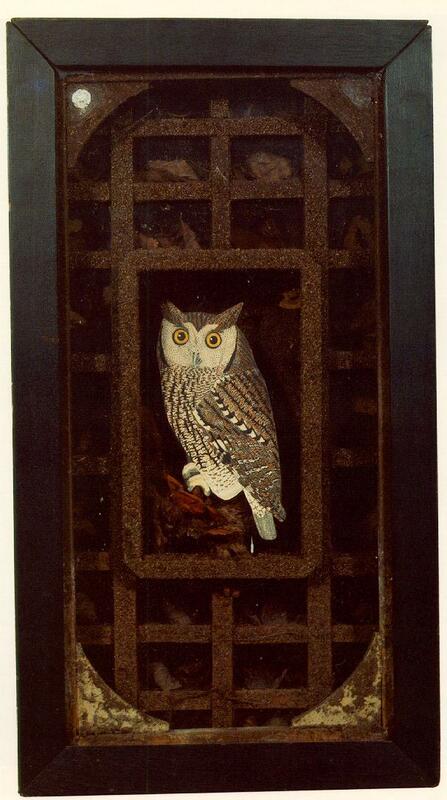 Please join me in honoring Joseph Cornell today. 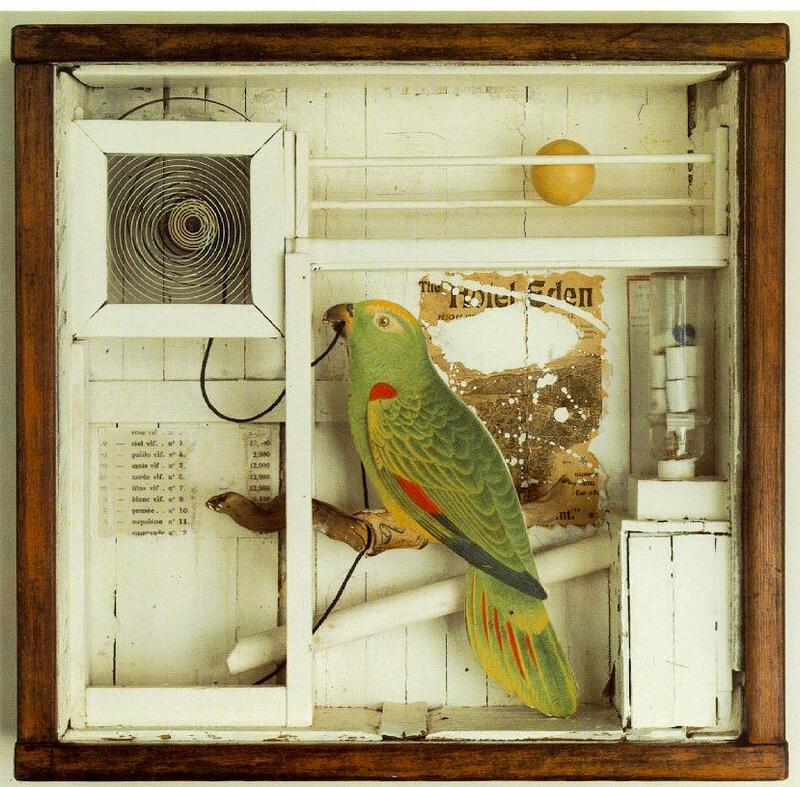 Joseph Cornell (December 24, 1903 – December 29, 1972) was an American artist and sculptor, one of the pioneers and most celebrated exponents of assemblage. Influenced by the Surrealists, he was also an avant-garde experimental filmmaker. 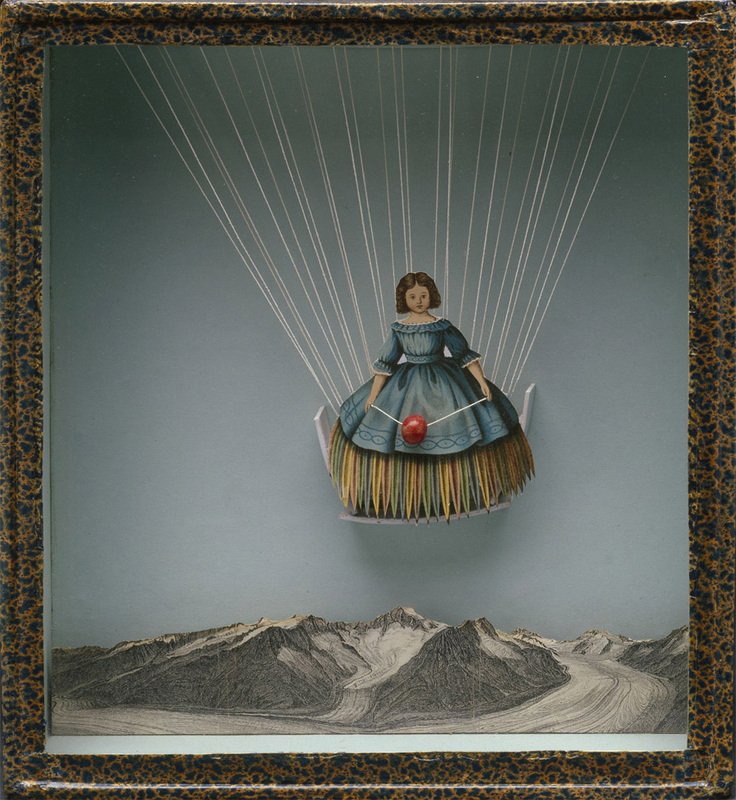 Joseph Cornell was born in Nyack, New York, to Joseph Cornell, a well-to-do designer and merchant of textiles, and Helen TenBroeck Storms Cornell, who had trained as a kindergarten teacher. The Cornells had four children: Joseph, Elizabeth (b. 1905), Helen (b. 1906), and Robert (b. 1910). Both parents came from socially prominent families of Dutch ancestry, long-established in New York State. Cornell’s father died in 1917, leaving the family in strained circumstances. Following the elder Cornell’s death, his wife and children moved to the borough of Queens in New York City. Cornell attended Phillips Academy inAndover, Massachusetts, in the class of 1921, although he did not graduate. house on Utopia Parkway in a working-class area of Flushing, along with his mother and his brother Robert, whom cerebral palsy had rendered physically challenged. Aside from the aforementioned period he spent at the academy in Andover, Cornell never traveled beyond the New York City area. Cornell was wary of strangers. 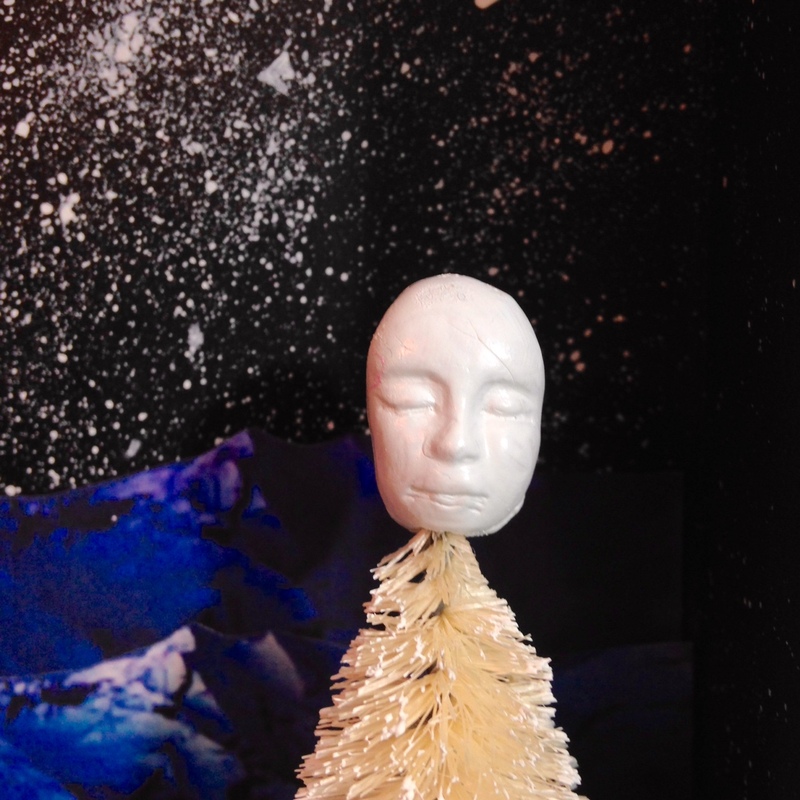 This led him to isolate himself and become a self-taught artist. Although he expressed attraction to unattainable women like Lauren Bacall, his shyness made romantic relationships almost impossible. In later life his bashfulness verged toward reclusiveness, and he rarely left the state of New York. However, he preferred talking with women, and often made their husbands wait in the next room when he discussed business with them. He also had numerous friendships with ballerinas, who found him unique, but too eccentric to be a romantic partner. His last major exhibition was a show he arranged especially for children, with the boxes displayed at child height and with the opening party serving soft drinks and cake. He devoted his life to caring for his younger brother Robert, who was disabled and lived with cerebral palsy. This was another factor in his lack of relationships. At some point in the 1920s, or possibly earlier, he read the writings of Mary Baker Eddy, including Science and Health with Key to the Scriptures. Cornell considered Eddy’s works to be among the most important books ever published after the Bible, and he became a lifelong Christian Science adherent. He was also rather poor for most of his life, working during the 1920s as a wholesale fabric salesman to support his family. As a result of the American Great Depression, Cornell lost his textile industry job in 1931, and worked for a short time thereafter as a door-to-door appliance salesman. During this time, through her friendship with Ethel Traphagen, Cornell’s mother secured him a part-time position designing textiles. In the 1940s, Cornell also worked in a plant nursery (which would figure in his famous dossier “GC44”) and briefly in a defense plant, and designed covers and feature layouts for Harper’s Bazaar, View, Dance Index, and other magazines. He only really began to sell his boxes for significant sums after his 1949 solo show at the Charles Egan Gallery. produced fewer box assemblages in the 1950s and 1960s, as his family responsibilities increased and claimed more of his time. He hired a series of young assistants, including both students and established artists, to help him organize material, make artwork, and run errands. At this time, Cornell concentrated on making collages, and collaborated with filmmakers like Rudy Burckhardt, Stan Brakhage, and Larry Jordan to make films that were evocative of moving collages. In 1967 the artist was reported in possession of two or three original drawings from Antoine de Saint-Exupéry’s The Little Prince. 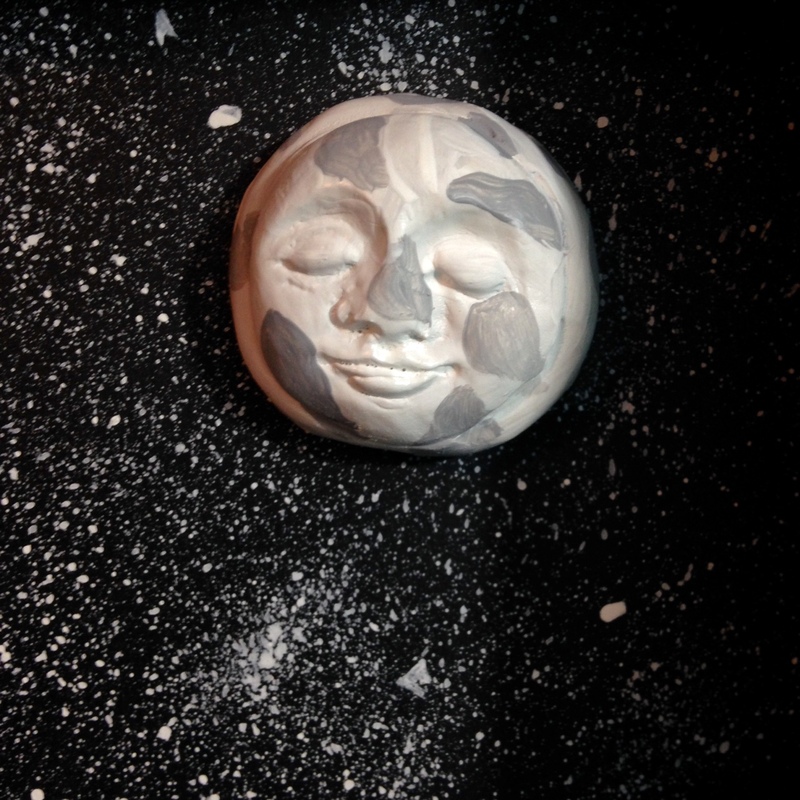 The exiled Saint-Exupéry’s wife, Consuelo, was similarly an artist and sculptor. Cornell’s brother Robert died in 1965, and his mother in 1966. 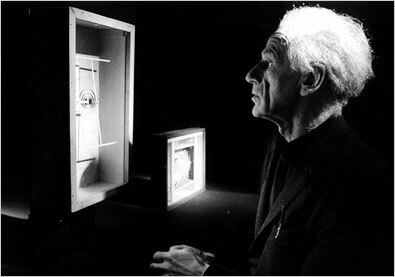 Joseph Cornell died of apparent heart failure on 29 December 1972, a few days after his sixty-ninth birthday. The executors of his estate were Richard Ader and Wayne Andrews, as represented by the art dealers Leo Castelli, Richard Feigen, and James Corcoran. Later, the Joseph and Robert Cornell Memorial Foundation was established, which administers the copyrights of Cornell’s works and represents the interests of his heirs. Currently, the Foundation is administered by Trustees, Richard Ader and Joseph Erdman. 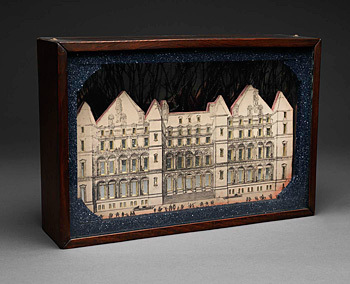 Cornell’s most characteristic art works were boxed assemblages created from found objects. 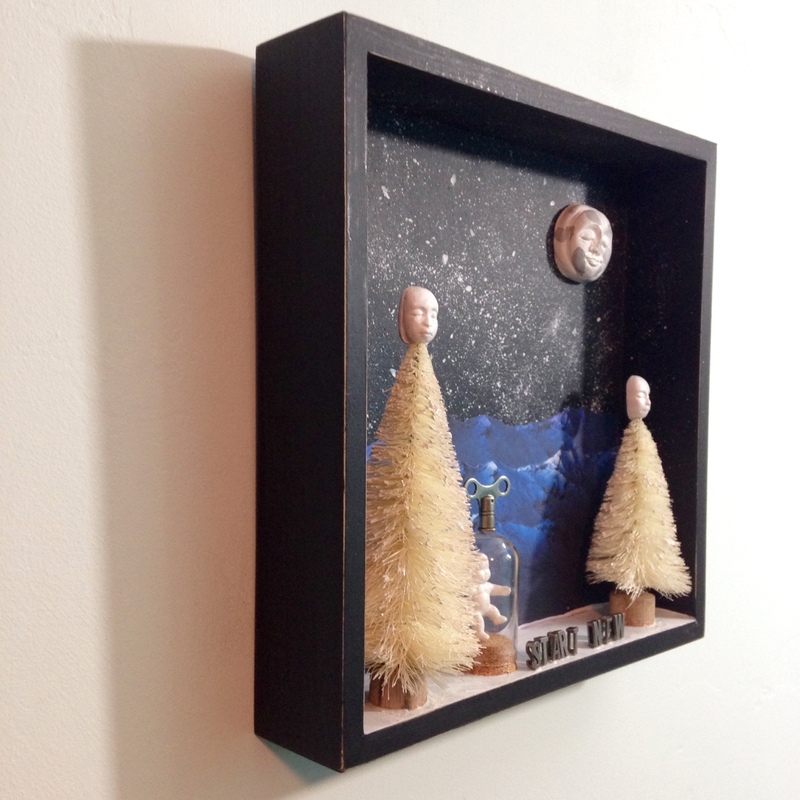 These are simple shadow boxes, usually fronted with a glass pane, in which he arranged eclectic fragments of photographs or Victorian bric a brac, in a way that combines the formal austerity of Constructivism with the lively fantasy of Surrealism. 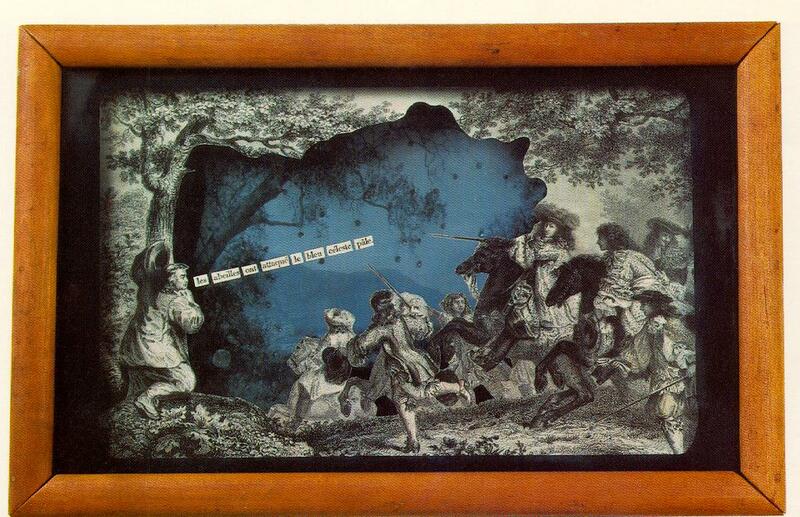 Many of his boxes, such as the famous Medici Slot Machine boxes, are interactive and are meant to be handled. Like Kurt Schwitters, Cornell could create poetry from the commonplace. Unlike Schwitters, however, he was fascinated not by refuse, garbage, and the discarded, but by fragments of once beautiful and precious objects he found on his frequent trips to the bookshops and thrift stores of New York. His boxes relied on the Surrealist use of irrational juxtaposition, and on the evocation of nostalgia, for their appeal. Cornell never regarded himself as a Surrealist; although he admired the work and technique of Surrealists like Max Ernst and René Magritte, he disavowed the Surrealists’ “black magic,” claiming that he only wished to make white magic with his art. Cornell’s fame as the leading American “Surrealist” allowed him to befriend several members of the Surrealist movement when they settled in the US during the Second World War. Later he was claimed as a herald of pop art and installation art. Object Boxes, among others. 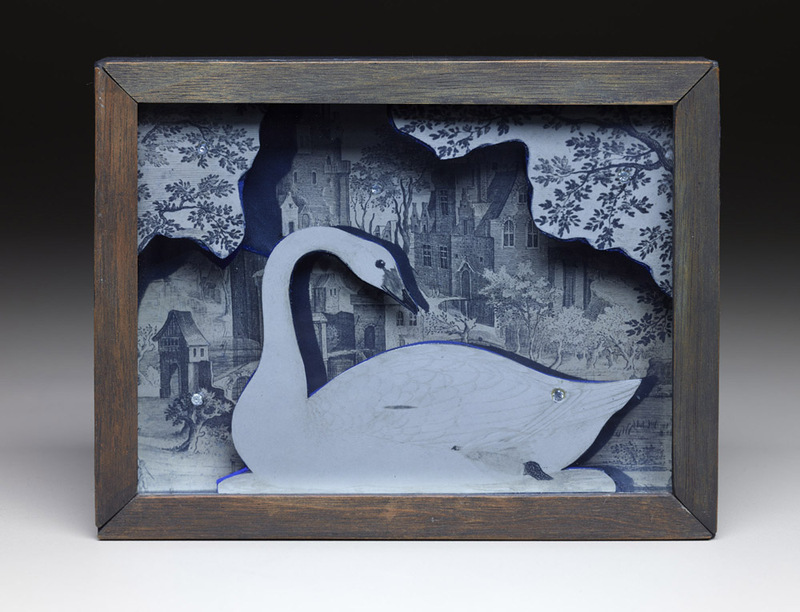 Also captivated with birds, Cornell created an Aviary series of boxes, in which colorful images of various birds were mounted on wood, cut out, & set against harsh white backgrounds. 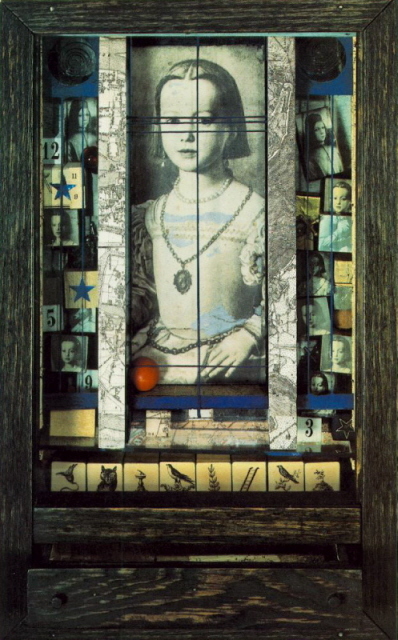 In addition to creating boxes and flat collages and making short art films, Cornell also kept a filing system of over 160 visual-documentary “dossiers” on themes that interested him; the dossiers served as repositories from which Cornell drew material and inspiration for boxes like his “penny arcade” portrait of Lauren Bacall. He had no formal training in art, although he was extremely well-read and was conversant with the New York art scene from the 1940s through to the 1960s. Somewhere in the city of New York there are four or five still-unknown objects that belong together. Once together they’ll make a work of art. That’s Cornell’s premise, his metaphysics, and his religion….Marcel Duchamp and John Cage use chance operation to get rid of the subjectivity of the artist. For Cornell it’s the opposite. To submit to chance is to reveal the self and its obsessions. Cornell was heavily influenced by the American Transcendentalists, Hollywood starlets (to whom he sent boxes he had dedicated to them), the French Symbolists such as Stéphane Mallarmé and Gérard de Nerval, and great dancers of the 19th century ballet such as Marie Taglioni and Fanny Cerrito. Christian Science belief and practice informed Cornell’s art deeply, as art historian Sandra Leonard Starr has shown. I hope you enjoy my piece today! I will see you tomorrow on Day 346. 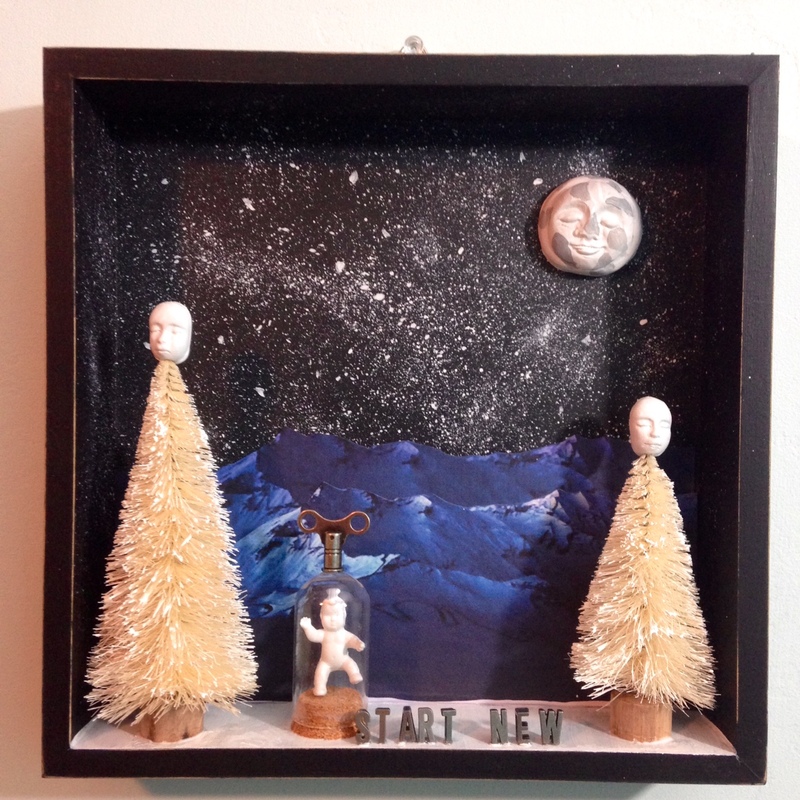 So glad you’ve got to Joseph Cornell, I love his ideas and his boxes! 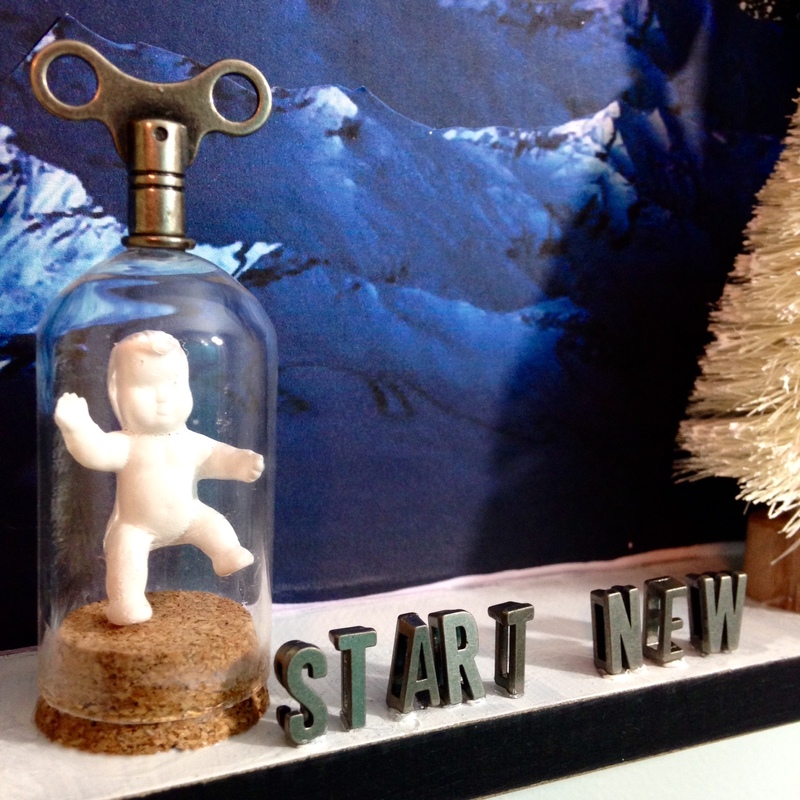 I love yours too, it’s a bit mysterious and a bit Christmassy too, very apt. Well done! Thanks! Glad you enjoy it. 🙂 it kind of all came together mysteriously!